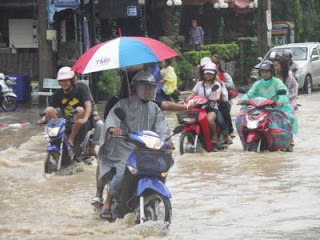 Floods in Patong today, but I did not get wet at all! 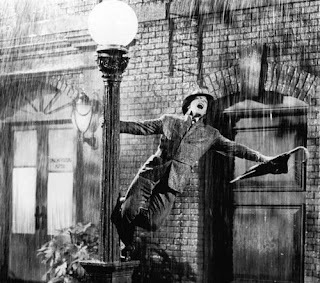 Today's weather shows just how localised the rain can be. This morning I could see dark clouds over the hills, but there was no sign of rain where we live just a few miles away. I rode my moped to work as normal. We had some rain in Karon for an hour or so, quite heavy in fact, but nothing unusual. Later it looked menacing again so I left the office a bit early and made a dash for it. The roads into Patong were muddy. You could see where rain had washed dirt over the road from the hills. So it must have rained a lot in Patong today. Heavy rain this morning flooded Patong’s busy streets. An officer at the Patong Municpality office of the Department for Disaster Prevention and Mitigation told the Gazette that the flooding was at its worst about midday, as the rains continued to fall and the drains had yet to deal with the deluge that had already hit the resort town. The water was deepest along the new, unfinished road behind the Jungceylon shopping complex, where people waded waist-deep through puddles, the officer said. Nothing close to floods in Karon beach, though I must say the drains in Patong are pretty useless when it rains hard. My wife was at home just around the time when it was raining hard in Karon and flooding in Patong. Our house is 4 miles from Patong Beach as the crow flies. There was just light drizzle on our house at that time, she says. The heavy rain can be very isolated. Who knows, maybe it was sunny in Phuket Town!